Other Products: Cardstock (White, Plum), ColorBox Ink- Seaweed, Close To My Heart Ink (Chocolate, Eggplant), Ivory Burlap String, Gems, Scrapbook Adhesives by 3L (Crafty Foam Tape, 3D Foam Squares, Adhesive Dots (Mini, Medium), E-Z Runner Grand. Instructions: Plum cardstock is the background. Using the large Intricate Swirl Frame die, cut one from white cardstock, and one from plum cardstock. I cut the white cardstock piece in half both ways, creating 4 pieces. Adhere these pieces to the 4 corners of the layout. Cut a strip of the green patterned paper that is 3x12 and adhere along the middle of the layout. Cut a strip of the purple patterned paper that is 5.5x12 and a piece of the pink patterned paper that is 6.25x12. Adhere these together and attach in the middle of the layout. Cut a piece of the burgundy patterned paper that is 3x3 and cut in half diagonally. Attach to the corner of the plum Intricate Swirl Frame, and cut off what is not needed. Adhere to the top of the layout using 3D Foam Squares. 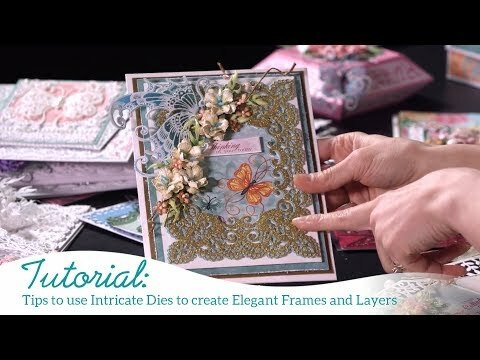 Cut one of the Eyelet Lace Frame dies from white cardstock. Mat this in plum cardstock. Adhere these together using Crafty Foam Tape. Adhere to the layout using Crafty Foam Tape again. Attach your 4x6 photo. Find and die cut out the green mini tag and adhere just above the matted photo. Add a bow of Ivory Burlap String. Find and cut out the "Live in the Moment" sentiment and adhere to the right of the matted photo. Stamp and die cut 4 sets of the Classic Rose and Leaves using chocolate ink. Using ink and daubers add color to the leaves using Seaweed (dark green). Add color to the flowers using Berrylicious ink and daubers. 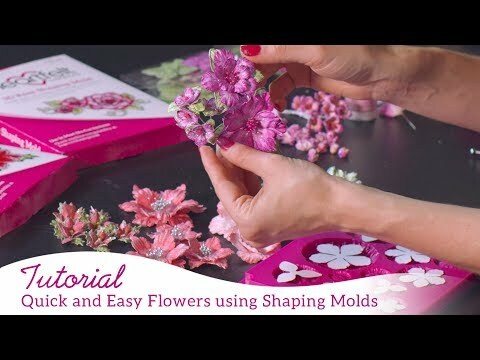 Shape the flowers and leaves using the 3D Rose Shaping Mold and the Deluxe Flower Shaping Kit Add gems to the middle of each flower. Adhere the flowers to the layout, 2 on either side of the matted photo.